This Par 3, 9-hole parkland golf course offers magnificent views of the Antrim coast and across the sea to Scotland. All ages and standards of golfer are welcome from the beginner to the experienced golfer. As a public course no membership or prior booking is required, although membership packages are available. Opening times, 9 Hole Golf Prices and our Golf FAQs are also included below. 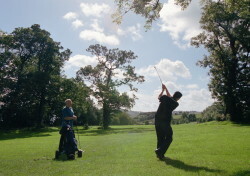 Green fees are payable through Activity Centre kiosk or if closed through Visitor Centre or On Site Warden. Membership also available. Regular spot checks carried out on the course. Club hire is available from both the Activity Centre and the Matt Stewart Golf Academy on payment of a hire charge and deposit, which is refundable, subject to the safe return of equipment. Various golf course membership packages exist which offer great value for money - click for details of prices. Although the course has no clubhouse, a full range of meals, snacks and refreshments are available from the Cafe or the Snack Stop. Groups can be catered for by prior arrangement. Green fees and membership fees are payable through Activity Centre kiosk or if closed through Visitor Centre or onsite Warden. * A 25% discount applies for adult or senior citizen golfers purchasing their car parking season pass at the time of green fees purchase. No parking season pass is supplied with junior membership. ** 2 passport photographs to be supplied when purchasing golf season pass at Visitors Centre. Q. Do you have golf buggies or trolleys available for hire? A. No. However golf bags can be hired from the Activity Centre or Matt Stewart Golf Academy. Q. Does the course have a golf professional? A. Yes. The Matt Stewart Golf Academy provides a dedicated golf professional and also offers lessons. Q. Does the course have a club house? A. No. The nearest golf course with a clubhouse is Cairndhu Golf Club. However catering is available onsite at the Visitor Centre cafe or Activity Centre Snack Stop. Q. Can I go have lunch in the cafe or Snack Stop then continue playing? A. Yes. The daily green fees are for unlimited play during the day of payment, up until the golf course closes. Q. Can I drink alcohol on the course? A. No. Consumption of alcohol is not permitted on the golf course or elsewhere in the Park (see details in restrictions section).